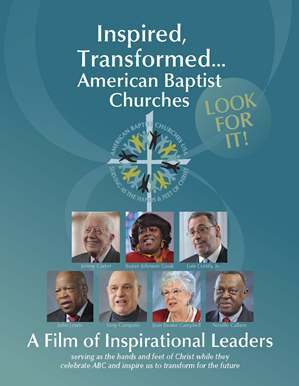 Inspired, Transformed…American Baptist Churches, celebrating God’s wonderful gift to us of being American Baptists by some of today’s most important and tireless religious and social activists: Jimmy Carter, Suzan Johnson Cook, Luis Cortés, Jr., John Lewis, Tony Campolo, Joan Brown Campbell and Neville Callam. Referencing their personal stories, they remind us that we are a people always being inspired and transformed by the Spirit as we serve as the hands and feet of Christ. At this important juncture in ABC’s history, we are receiving a fresh movement of the Spirit, we are moving toward the vibrant future to which we believe God is leading us.